In David Herndon's favor is his excellent sinker which has helped him make a solid impression in spring training thus far. Also in Herndon's favor is the fact that he's a Rule 5 pick that must either be on the 25-man Major League roster all season or be offered back to the Angels, the organization he pitched for prior to the Phillies making him a Rule 5 draft pick over the off-season. Additionally in Herndon's favor are delays in the recovery schedules of the injured Brad Lidge and JC Romero. All those factors combined could land Herndon a spot in a big league bullpen. A talented righty reliever, Herndon had not pitched above the Double A level through his 2009 season, but stands a good chance at facing Major League hitters very soon. Herndon, who stands 6-feet 5-inches tall and is 24 years old, has thrown 5 scoreless innings in Grapefruit League play thus far with the Phillies. With Double A level Arkansas in 2009, Herndon had a 5-6 record with 11 saves and a 3.03 ERA in 50 games. 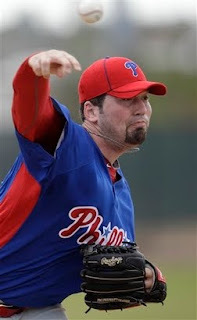 Phillies catcher Brian Schneider has been impressed with Herndon's sinker. If Herndon can make a similar impact with his fastball and his slider, he could very well end up being a sparkling addition to the Phillies' bullpen. In the Dominican Winter League Herndon worked with Gulf Coast League Phillies pitching coach Carlos Arroyo to improve the slider, which had previously not been much of a plus in Herndon's repertoire. The additional work helped and the slider not features a sharper break. The Phils are taking full notice of Herndon, who has outperformed the likes of phan favorite right-hander Scott Mathieson, and the collection of lefties vying to fill JC Romero's spot. Don't call Herndon a long shot anymore. He could be close to locking up a roster spot for himself. **UPDATE** Herndon threw against the Yankees on Monday afternoon. In his first inning of work, Herndon retired the Yankees hitters 1-2-3 on 7 pitches. Herndon followed that up by retiring the first two batters he faced in his second inning of work, before surrendering back to back singles to Curtis Granderson and Mark Teixeira. Herndon then retired Nick Swisher to complete two shut out innings.